Well, it’s official, CG humans are totally creepy. A Christmas Carol is the story of Ebenezer Scrooge, a real jerk of a guy who loves his money more than life itself, despises absolutely everyone – especially those who don’t have any money, and totally hates on everything Christmas. So one night, he gets visited by three spirits who show him how he used to be a happy fellow that liked both Christmas and the human race, how he slowly turned into one major Grinch, and how he’s ultimately gonna die unless he gets his act together. Everyone knows this story, you get the gist. So what makes Robert Zemeckis’ Christmas Carol different from, say, every other iteration you’ve heard or seen before? Well, the short answer is that it’s now in 3-D. The long answer is…well, that’s kinda the long answer, too. Man, before it starts sounding like Scrooge himself is behind the keyboard, let me take a minute here to preface this thing before I start bringing everybody down. I know A Christmas Carol as well as the next Joe, and while it is a great story that almost always gets that lump in my throat going as soon as Ebenezer buys Tiny Tim that big fat turkey, it’s never been a “classic” to me. It’s not like A Christmas Story or It’s a Wonderful Life where December 25th just seems off without it. I don’t know what it is, but it’s never been tradition and I’ve never really connected with it in the way that a lot of other people have. But don’t get me wrong, that’s not the reason I dropped a 4 bomb on this movie. The main reason probably goes back to the whole 3-D thing. With the exception of The Polar Express, I’m not really digging this whole obsession with the third dimension that Zemeckis is currently hooked on. And maybe I was just spoiled after having my head explode during Avatar in 3-D the day before, but I’m still not buying into Zemeckis’ idea of when and why 3-D should be used. 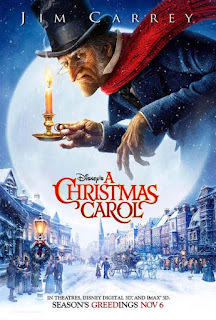 Look, has anyone out there ever watched A Muppet Christmas Carol or ever read Dickens’ original story and thought to themselves, “You know what, this would be freakin’ AWESOME in 3-D!” Gonna take a shot in the dark here and give that one a “No”. And that’s the thing, of all the stories in the history of time that this gimmicky technology might actually work well on, how did A Christmas Carol find itself bumped to top of the list? But aside from being an unnecessary gimmick, I felt like the 3-D element ended up taking away from the story as a whole. The reason A Christmas Carol is a timeless classic isn’t because of all the untapped visual potential that’s been lying dormant for the past 150 years, it’s because of its universal message that’s remained true and relevant for generations of people across the globe. And even though the story is still here, too much time was spent on making it look pretty instead of keeping the focus on the movie’s heart. But with the exception of the computer generated humans that are look far too realistic for their own good, everything else does look quite pretty indeed. And I can’t say that I’ve ever had the dis/pleasure of watching computer generated actors overact, but Jim Carrey gets it done. Wouldn’t have been my pick for Scrooge, but that’s just me. Although having him play the Spirits as well was a pretty cool move. I dug that. Gary Oldman is also good as Bob Cratchit. Can’t go wrong with Oldman. So take away what you will from my review as this is just one guy’s opinion. I saw this with two of my friends and my good buddy Fred and I was both the least enthusiastic going into it and the least impressed by it coming out. In the end, it’s still the great story we all know, so that’s good, but it’s just not my favorite adaptation is all. Sorry to be such a buzzkill, folks. I swear my It’s a Wonderful Life review is gonna be a lot jollier than this one. Jim Carrey looks almost as creepy as Ray Winstone’s Beowulf (although in that movie stop-motion animation was used). There’s something about the human face and its many intricacies that I fear CGI won’t ever be able to capture. I thought this was a really well done interpretation of the novel. The visuals were amazing and keep you intrigued. But it’s not really a kid’s movie, or a Disney movie in the normal sense. It is dark, scary and pretty serious most of the time. There are only a few gags and I think they are there so the audience doesn’t get completely depressed. The visuals and 3D animation are the main reason to see this movie, particularly in theaters, but I think the animation was the focal point because how else do you keep selling the same story to the same audience year after year without the audience getting bored? I understand your criticism, but a 4 is pretty low. You gave My Bloody Valentine a 4, you’re gonna tell me this was as bad as that? I am going to punch you in the face SO HARD! Joke is on them, too. I deserve the punch in the face now. Well I haven’t put this in my top 10 Zemeckis movies…which I’m currently working on. And neither is Beowulf or The Polar Express, so I think that shows I’m in the same boat as you in terms of Zemeckis’ obsession with 3D and motion-capture animation. Not that I think they are bad movies – I’m a big fan of Zemeckis and like pretty much all his work, but the whole 3D thing leaves me cold anyway. Unless I’m sat in a moving chair at Universal Studios Florida with flying mechanical props and actors really jumping out of the screen and blowing stuff up around me, 3D movies don’t appeal. At the end of the day, as a critic, how far can you rate the 3D element of the movie in terms of what determines whether a film is good or bad. Pretty low I think. It’s a gimmick to me and like in the 1980s I can see it disappearing once again. Just the high-action and desire to have a 3-D look, took a lot away from the timeless story.